SIGN YOUR TEAM UP RIGHT NOW FOR THE INAUGURAL DREAM CHALLENGE! Win luxurious prizes and a trip to compete at the Liberty Mutual Invitational at the famed Ocean Course at Kiawah Island! SIGN YOUR TEAM UP NOW FOR THE 2ND ANNUAL MENTOR CUP! 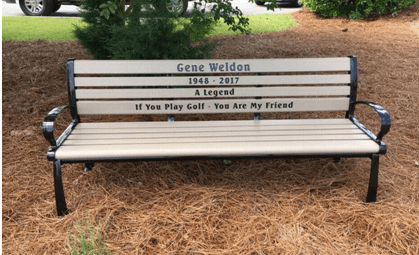 Gene’s Dream Foundation is in honor of the late Gene Weldon, a dedicated PGA professional who was a mentor to countless junior golfers in the Carolinas including Golf Channel’s Kelly Tilghman & Charlie Rymer. Weldon’s legacy lives on through the foundation and the Mentor Cup, a tournament that creates a bonding atmosphere for adults and juniors alike. More than 50 Mentor/Mentee teams participated in a fun filled format. David Feherty donated a two-hour standup comedy performance with all proceeds benefitting Gene’s Dream Foundation, The First Tee of Coastal Carolinas and Project Golf. 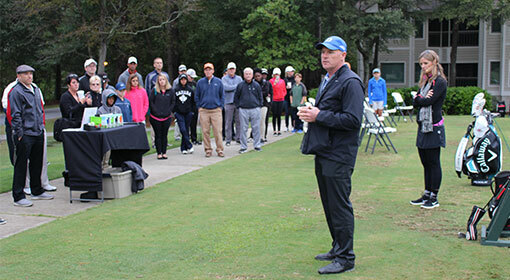 Hall of Fame Coach Dan Brooks gave a motivational speech to children on the educational opportunities golf can provide. 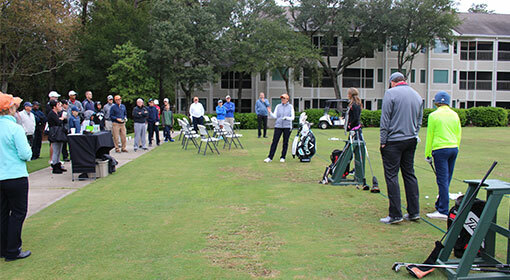 Life long LPGA teaching professional Jamie Fisher provided adults and juniors with priceless golf lessons. Over the course of his lengthy golf career, Gene Weldon was constantly trying to solve his putting woes to the point where it became the running joke with his family and friends. After trying countless styles and grips, Gene finally landed on a, still unreliable, long putter. In the inaugural Mentor Cup golf tournament, all contestants got the chance to putt with our namesake’s notoriously balky long putter. 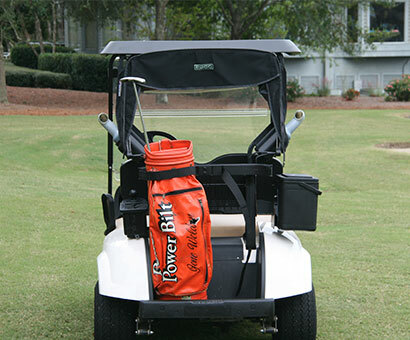 We parked a golf cart by the 18th green with his putter inside his old Power Bilt golf bag. It was inspiring to see so many people using the same putter that Gene did. On Friday, October 26th, an elegant evening at The Surf Golf & Beach Club welcomed more than 100 guests who were delighted by a surprise visit from golf’s funnyman David Feherty. 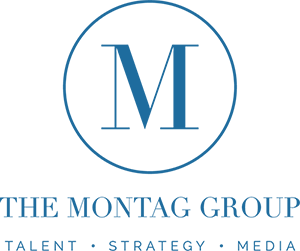 After enjoying complimentary cocktails and a silent auction, guests were treated to a delicious meal while being entertained by the likes of Kelly Tilghman, David Feherty, Charlie Rymer and football great Sterling Sharpe. The night also featured a live auction with Duke men’s basketball ‘game of choice’ tickets, a 2020 Ryder Cup experience and a golf getaway with Charlie Rymer at the prestigious Honors Club in Tennessee. October 27 – Feherty: Off Tour Live! The inaugural Mentor Cup weekend ended in thrilling fashion when the hilarious David Feherty performed his wildly popular stand up comedy show at the Myrtle Beach Convention Center. 150 VIP guests enjoyed a special meet and greet with David, complete with an autographed copy of his latest book. All proceeds went to Gene’s Dream Foundation and The First Tee of Coastal Carolinas. 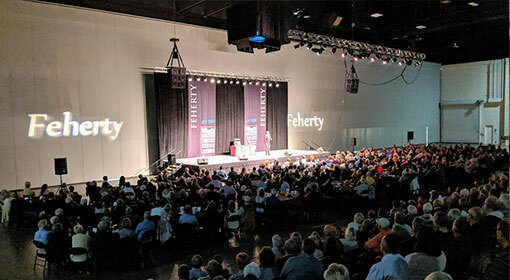 Out of the goodness of his huge heart, David Feherty donated a 2-hour stand-up comedy performance that brought the house down at the Myrtle Beach Convention Center. His wildly popular Feherty: Off Tour Live! attracted guests from far and wide. 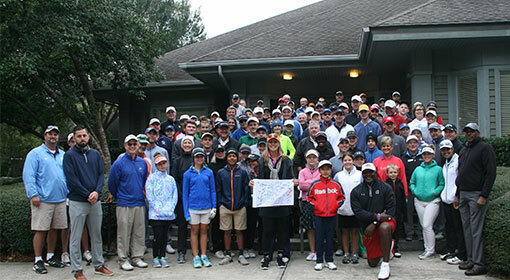 All proceeds benefitted Gene’s Dream Foundation and The First Tee of Coastal Carolinas.